I'm a huge fan of Justin Timberlake, I have been since I was thirteen. He's a talented singer, dancer, actor and just a great performer. So when I had the opportunity to review Runner Runner, I definitely wanted to give it a try because I am a fan. I'm not really a Poker kind of girl, that's and action movies aren't really what I would go for it I had to choose a certain genre, but I do admit this was a pretty good movie. It definitely caught my attention and my husband seemed to love it. The fact that the main character, Richie Furst, set out on a mission to get his money back from an online company that ripped him off is pretty crazy, I personally wouldn't go looking for the head guy myself, but as Richie does he finds himself in a whole new adventure. This movie is packed with lots of action with a great story line. Any fans of poker or action movies should definitely give this movie a try. Disclosure: All opinions are my own. 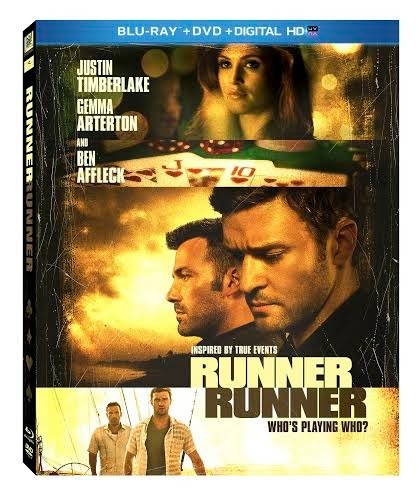 I received Runner Runner on blu-ray DVD at no cost for the purpose of this review. No other compensation was received.